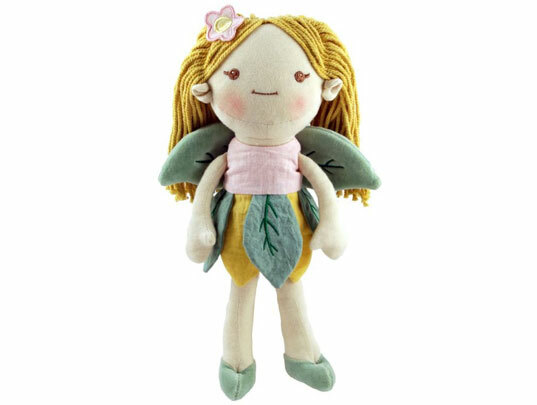 Meet your little girl’s next favorite doll: My Natural Good Earth Fairy from MiYim, an eco-conscious company that boasts a line of adorable organic cotton toys and baby accessories. Featuring a full head of yarn-like hair and sweet velvety wings, this limited edition fairy rag doll is made from untreated, unprocessed and unbleached cotton. A safe doll for all ages, the fairy gets her hue from mineral and soy colorings through a low-impact dye process. And the Good Earth Fairy comes packaged in a ready-to-gift reusable, recycled cardboard box, making her perfect for Christmas or the next birthday party your kid gets invited to. Meet your little girl's next favorite doll: My Natural Good Earth Fairy from MiYim, an eco-conscious company that boasts a line of adorable organic cotton toys and baby accessories. Featuring a full head of yarn-like hair and sweet velvety wings, this limited edition fairy rag doll is made from untreated, unprocessed and unbleached cotton. A safe doll for all ages, the fairy gets her hue from mineral and soy colorings through a low-impact dye process. And the Good Earth Fairy comes packaged in a ready-to-gift reusable, recycled cardboard box, making her perfect for Christmas or the next birthday party your kid gets invited to.